The UN Security Council condemned the Syrian regime at an emergency meeting Sunday, holding president Bashar al-Assad's military responsible for the massacre of more than 100 people, dozens of whom were children younger than 10 years old. Syria on Sunday strongly denied allegations that its forces killed scores of people — including women and children — in one of the deadliest days of the country's uprising, but the UN Security Council after an emergency session condemned government forces for shelling residential areas. 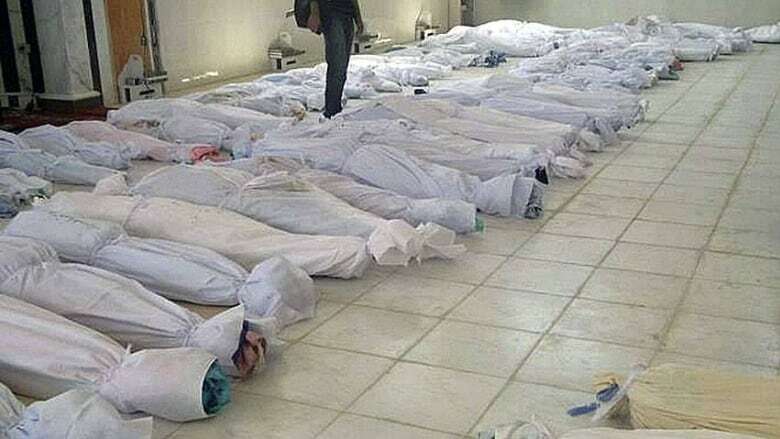 The killing of more than 100 people in the west-central area of Houla on Friday brought widespread international criticism of the regime of President Bashar al-Assad, though differences emerged from world powers over whether his forces were exclusively to blame. The council's statement said the "outrageous use of force" against civilians violated international law and Syrian government commitments under previous UN resolutions to stop all violence, including the use of heavy weapons in populated areas. It said "those responsible for acts of violence must be held accountable," and asked the UN observer mission in Syria and Secretary General Ban Ki-moon to investigate the attacks and report back to the council. Britain and France had proposed issuing a press statement condemning the attack on civilians and pointing the finger at the Syrian government for Friday's massacre. But Russia called for an emergency council meeting saying it first wanted a briefing by Gen. Robert Mood, the head of the unarmed UN observer mission. The massacre in Houla on Friday cast fresh doubts on the ability of an international peace plan put forward by UN-Arab League envoy Kofi Annan to end Syria's 14-month-old crisis. 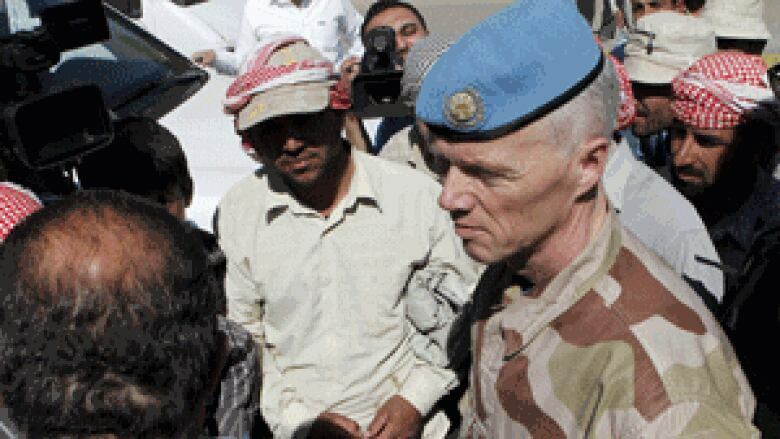 Mood told the Security Council that UN observers at the scene now estimate 108 people were killed in Houla, UN peacekeeping chief Herve Ladsous told reporters outside the council chamber. 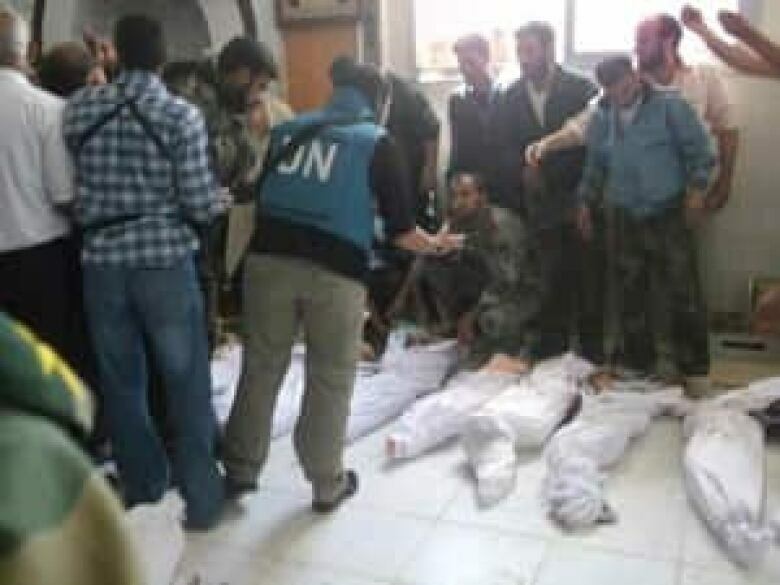 The UN counted 49 children and 34 women among the dead. Speaking to reporters in Damascus, foreign ministry spokesman Jihad Makdissi said Syrian security forces were in their local bases Friday when they were attacked by "hundreds of heavily armed gunmen" firing mortars, heavy machine-guns and anti-tank missiles, starting a nine-hour battle that killed three soldiers and wounded 16. "No Syrian tank or artillery entered this place where the massacres were committed," he said. "The security forces did not leave their places because they were in a state of self-defence." Throughout the uprising, the government has deployed snipers, troops and thugs to quash protests and shell opposition areas. A video released by the UN team in Syria on Sunday showed observers in Houla the day after the attack, meeting with local rebels and watching residents collect more bodies for burial. It also showed two destroyed armoured personnel carriers — suggesting that local rebels put up more of a fight than the activists acknowledged. In a letter to the Security Council, Ban said villages in the Houla area have been outside government control but surrounded by a heavy Syrian military presence. When UN observers visited the area on Saturday, Ban said they saw 85 corpses in a mosque in Taldou and "observed shotgun wounds and wounds consistent with artillery fire." He said "the patrol also saw artillery and tank shells, as well as fresh tank tracks" and observed that "many buildings had been destroyed by heavy weapons." At UN headquarters, Russia's deputy UN ambassador Alexander Pankin told reporters as he headed into the closed-door Security Council meeting that "there is substantial ground to believe that the majority of those who were killed were either slashed, cut by knives, or executed at point-blank distance." "We have to establish whether it was Syrian authorities … before we agree on something," he said. A press statement is weaker than a presidential statement, which becomes part of the council record, or a legally binding UN resolution, but it must be approved by all 15 members and therefore reflects strong Security Council backing. The Houla attacks have sparked outrage from U.S. and other international leaders, and renewed concerns about the relevance of a six-week-old international peace plan negotiated by Annan that has not stopped almost daily violence despite the presence of more than 250 UN observers. The UN put the death toll weeks ago at more than 9,000. Hundreds have been killed since. Canada’s Foreign Affairs Minister John Baird called the latest bloodshed "very disconcerting because of its depravity." He said the international community needs to redouble its efforts to get Syria to agree to an international peace plan mapped out a month ago, or explore other diplomatic solutions.